5What radical idea or change would you like archival institutions, archivists and librarians, and/or users of archives to adopt? ¶ 1 Leave a comment on paragraph 1 0 I would like archival institutions and archivists to take more risks and work more closely with underrepresented communities to ensure their perspective is recorded regardless of format. The documentation of different cultures and traditions produces an accurate depiction of society and will accurately inform the historical record. Ignoring or shying away from what is uncomfortable is a disservice to future generations and perpetuates only the views of majority institutions, elites, and/or leaders. ¶ 2 Leave a comment on paragraph 2 0 It is also important to document the now and the living. I consider contemporary archives to be quite useful. They are fundamentally unlike museums, where contemporary items are often collected in real time but are stored in warehouses for decades and not exhibited to the public. An archive has an opportunity to engage a variety of constituencies. We can ask the record creators and contributors about their lives and thoughts. We can collect their current records, rather than wait until they are gone. For when they are gone, their documents will have to be deciphered and interpreted by a researcher without the guidance of a living voice. 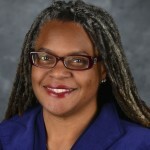 Meredith Evans became an associate university librarian at Washington University Libraries in November 2014, joining the Libraries’ senior leadership team. She leads the Department of Special Collections, which includes the Film and Media Archive, Manuscripts, the Modern Graphic History Library, Preservation, Rare Books, and University Archives. Evans deeply believes in supporting community collaborations to increase the number of collections that serve as evidence of written history. She is confident that community engagement leads to diverse collections and a more accurate depiction of history. Evans earned a master of library science from Clark Atlanta University and master’s degree in public history at North Carolina State University and her doctorate from the University of North Carolina at Chapel Hill.